Every year, 1.25 million people die on the road, 50 million more are injured. Road accidents kill 500 children every day and are the leading cause of death among 15-29 year olds. 1 in 5 drivers can’t see the road clearly, when 80% of all vision impairments can be prevented or cured. Everyone of the 2.5 billion people who cannot see the world clearly, use the road in some way as either pedestrians, passengers, cyclists or drivers. 90% of the 2.5 billion people suffering from uncorrected poor vision live in developing countries where the number of road accidents is particularly high. Our inclusive business and philanthropic projects are accelerating the fight for safer roads through national and local partnerships. These help create awareness and access to eye care, especially among drivers, who risk not only their own, but the safety of others, if they can’t see clearly. Here are just a few examples of partnerships happening around the world. In Kenya, we have joined forces with Uber. The partnership raises awareness of the importance of good vision and provides free vision screenings for 5,000 Uber drivers and their families making Kenya’s roads safer for drivers and passengers. 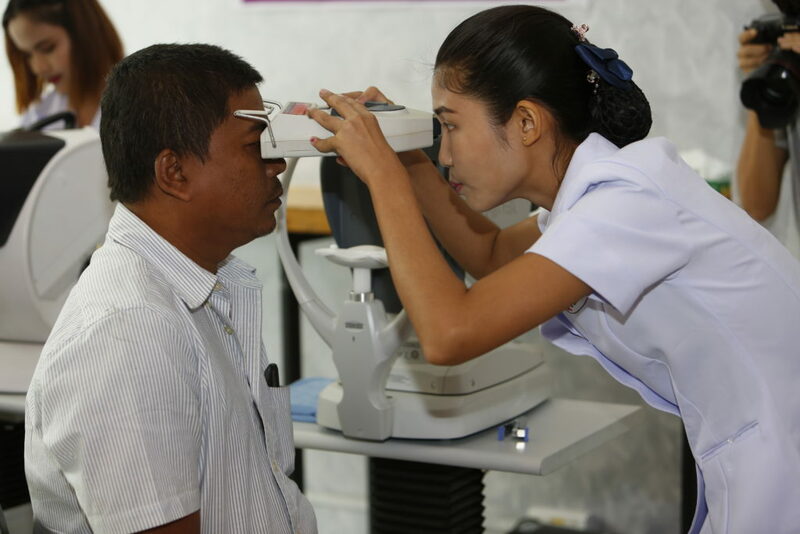 We partner with Grab, the leading on-demand transportation platform in Southeast Asia, in Myanmar, to provide free vision screenings for its driver partners. In 2015, a study conducted by the World Health Organization revealed that Myanmar has the second highest death toll of road accidents in the region. Our partnership was the first of its type to be formed in Myanmar with the aim of raising driver awareness of healthy vision and to make the roads safer for all. In 2016, road accidents claimed nearly 400 lives a day in India, more than any other country. In an effort to change this, the Vision Impact Institute (VII) works to impact road safety policies. This includes advocating for regular vision checks for Indian drivers to put it firmly at the top of the public agenda. In addition the Essilor Vision Foundation runs multiple screening events for professional drivers, most recently for Dabbawalas in Mumbai. Dabbawalas are a community of about 5000 road users who navigate Mumbai’s busy roads to deliver home-cooked food to people at work in an incredibly efficient system. By the end of 2018 we will have screened 2000 and hope to reach the remaining Dabawallas in the near future. On National Sight Day, Essilor Vision Foundation China and Bolon donated 2000 sunglasses to local policemen in Pingdingshan. Not only will this help them to protect their eyes from harmful UV rays, it will help ensure safer decisions are made on the roads by reducing glare and improving vision. In Brazil, where corrective glasses need to be prescribed by an ophthalmologist, our social business partner Ver e Viver (IVV) worked with Nissan, to organize mobile eye care clinics easily accessible for professional drivers. At the clinics, drivers received a comprehensive eye exam from an eye care professional and could then buy affordable glasses from a 2.5 New Vision Generation Vision Ambassador. Considering that 90% of all decisions behind the wheel depend on good vision we will be continuing to advocate for the importance of eye care to increase road safety and look for public, private and not-for-profit partners to help us put vision on the public health agenda.